Operational effectiveness and strategy are both essential, says this article from Harvard Business Review, to compete in today's market. At the same time, explains author Michael E. Porter of Harvard Business School, they work in different ways. 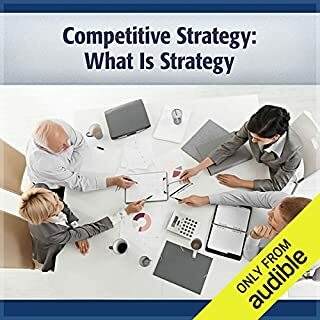 He provides examples of companies that have good operational effectiveness but little strategy (such as the majority of Japanese organizations) and explains why companies with effective strategies will always take the lead. He then explains the essentials of strategy, such as strategic fit and sustainability. 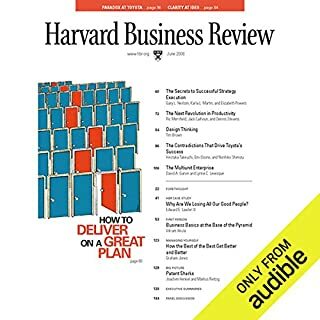 This article originally appeared in print in the November-December 1996 Harvard Business Review and is now available in audio format exclusively through Audible. 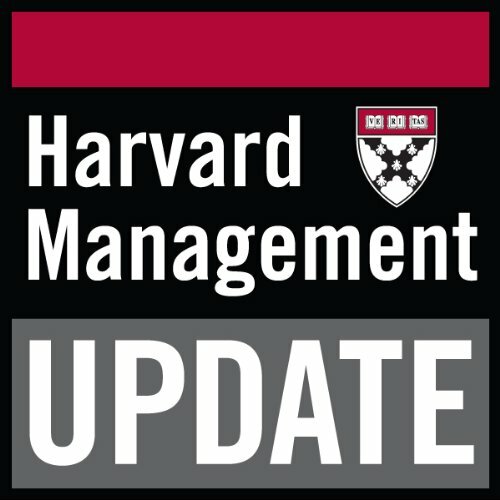 Want to sharpen your leadership skills with previous editions of the Harvard Management Update? You can find past issues from 1997 to the present by clicking on matching edition under periodicals. 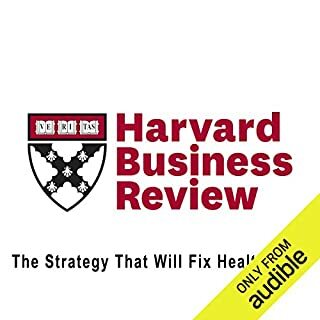 ©1996 by the President and Fellows of Harvard College, All Rights Reserved; (P)1997 Audible Inc.
As someone who hears the word "strategy" thrown around a lot, this was a refreshingly explicit. Should be titled What is Positional Strategy? I enjoyed this one and have recommended to the rest of the management team. It isn't as generic as the title sounds, it is much more aligned with positional strategy. It is extremely important that businesses understand this key term "strategy". A must-listen for students at B-school...wish I had done so. ...definitely worth collecting and referring to many more times. 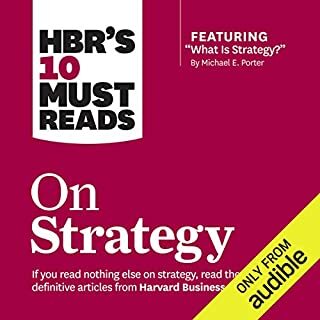 Porter was obviously discussed in Kiechell's book "The Lords of Strategy" and Porter's "What is Strategy" article was a key document in that book showing how Porter helped to guide the Strategy discussion later in his career. It is a short read but very dense in content on what strategy is and probably more importantly what it is not to defend off much of the Johnny come lately works out there on Strategy. Key concept in this work was that it isn't strategy unless it defines how you are going to break out of the pack doing some aspect differently then the rest in a defendable way that drives business value. Porter makes the argument that is is better to forge a new market niche even if in a new industry then trying to fight on the slippery slope of the also rans fighting in an un defendable cut throat market. great quick read to update.to strategy Michael porter. the narrator did a grand job with this program. Very abstract, lifeless. The content is good, but it could be written in a much better way with many more business stories. The stories included is very few to reduce the abstractness of the content. It has very interesting ideas but the super poor quality did not allow me to pay attention at all. DON'T buy anything by this narrator. This extremely short read is full of amazing and insightful information. I'm so very glad I read it. 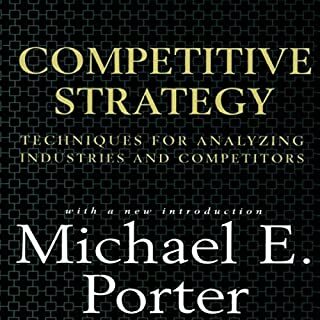 Michael Porter is the author of several classic business tombs, including the Competitive Strategy of Nations, Competitive Strategy: Techniques for Analyzing Industries and Competitors. I wish very much that they would make his books into audiobooks because they are like an MBA in their own right. I'd like to read them again and again to really make sure I full digest every element of them. Good information, but would probably get a lot more if there was a decent narrator. Narrator delivered a staccato performance. It felt like he was reading it for the first time and had no intonation. Even being familiar with Porter's concepts, it was hard to follow. A meaningful pause or emphasis on a word or phrase would have helped a lot. What did you take away from What Is Strategy? that you can apply to your work? Operational efficiency is a race to the bottom. Strategy is a set of activities that fit with your positioning. Managers need to make trade-offs to follow their strategy. The biggest decisions are choosing what not to do. For anyone studying business or for decision makers in organisations looking to get out of the "Me Too" business as usual mindset a solid understanding of Strategy is essential. 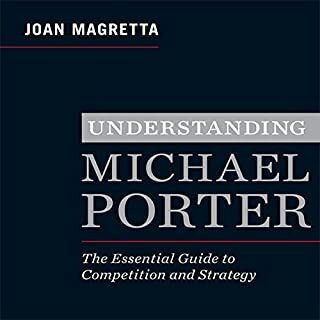 Porter's influential article, using clearly described case studies, illustrates what it means to utlilise Strategy to create and sustain competitive advantages over your competition.